I'm not a great movie buff, but three boats, from my ever growing collection of pop pop boats, triggered an association with the silver screen. Firstly, I recently purchased an interesting old boat in need of a bit of TLC (see above). 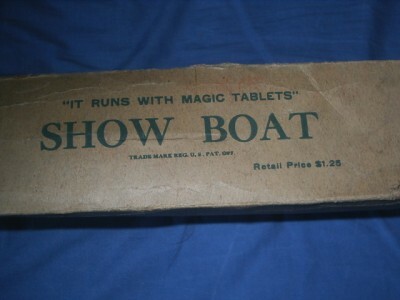 It came with the remains of the original box, which revealed it was marketed as a "SHOW BOAT". It measures approx. 10" long (25cm) long. I believe it dates from the 1930's and was made in the USA. 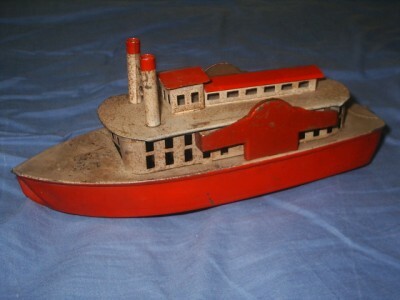 It is a coil type boat (see below). The box also proudly boasts, "It runs on Magic Tablets" (see below). For the record, the film musical of the same name was made in 1951 and starred Howard Keel, Ava Gardner and Kathryn Grayson amongst others. Surprisingly our second maritime star also hailed from 1951 and starred Humphrey Bogart, Katherine Hepburn and Robert Morley. Yes, you've guessed it, "The African Queen". My version of this riverboat was made by the German firm of Tucher & Walther in 2005, Art. No. T489 number 234 in a limited edition of 1,000 (see below). It measures approx. 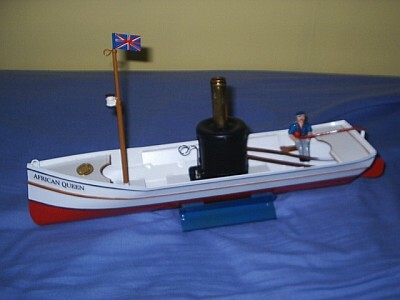 15" (37cm) long and like the "Showboat" is powered by a coil type engine. My last pop pop Oscar nominee is arguably the most famous ship of all time. 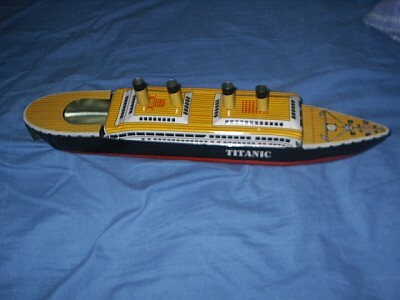 Whenever I display these boats, I hear the same comments time and again referring to the Titanic. "If I buy one will I get more than one voyage out of it? ", "Does it come with free icebergs?" etc. I have four models in my collection, bearing this name, but the one I have chosen to comment on is probably the most well known. Still currently in production, it comes from the Indian firm of Ratandeep Enterprises (see below). 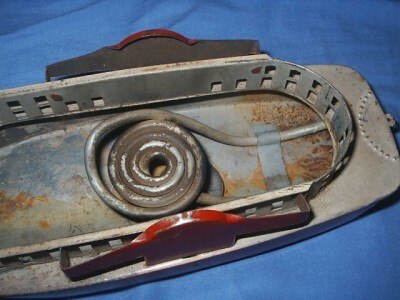 It has a large diaphragm type engine and measures approx 15.5" (39cm) long. 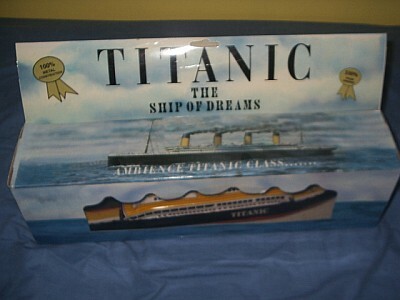 It comes in an elaborate presentation box (see below) alluding to the "ship of dreams". It is also available in kit form, unpainted. So our third film, released in 1997 and starring Leonardo DiCaprio and Kate Winslet, was a huge success landing eleven academy awards and costing $200 million to make. With the credit crunch I think I'll stick to a few pounds worth of low tech tin plate chugging round the bath and maybe curl up in my armchair and watch those silver screen heros on the haunted fish tank.